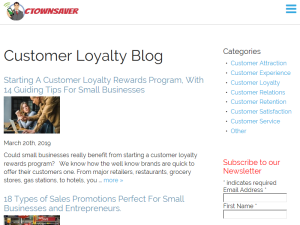 CTownSaver's blog helps businesses grow with mobile marketing tips, news, and advice on mobile loyalty, running promotions, e-mail and text message marketing, social and brand advocacy and more. Customers habits keep changing, we keep you up-to-date so you can create customer loyalty. This what your CTownSaver's Blog Blog Ad will look like to visitors! Of course you will want to use keywords and ad targeting to get the most out of your ad campaign! So purchase an ad space today before there all gone! If you are the owner of CTownSaver's Blog, or someone who enjoys this blog why not upgrade it to a Featured Listing or Permanent Listing?